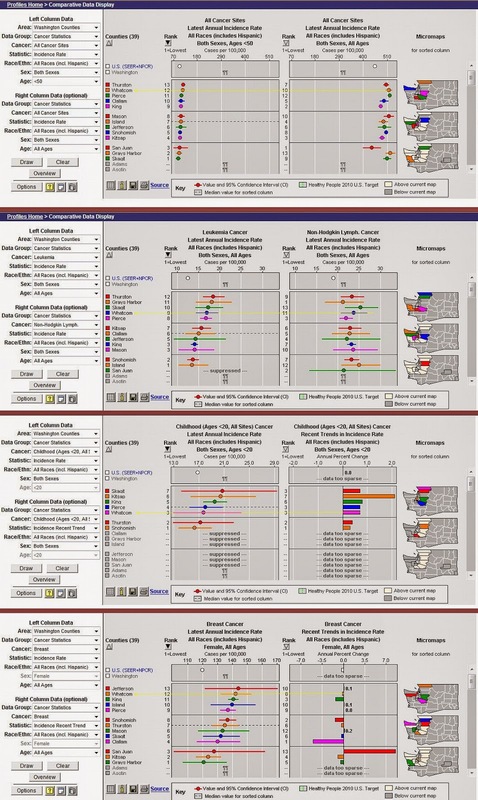 Below the break is a cancer montage for WA State from NCI State Cancer Profiles. The SEER*Stat data covers 2012. Washington is one of three states that currently has "data too sparse" to allow a comparison with the rest of the states on NCI Micromaps for the latest annual and recent trends in incidence rates for all ages,sexes,races. With only 13 counties reporting for most of these graphs, one can see why. I have drawn a yellow line across Whatcom County in the four charts below. In their most recent annual report, the Cancer Center at Peace Health points out that their collection is probably more extensive than many other counties. Of this, I have little doubt. One of the best reasons to live in Whatcom County is the competence of it's medical practitioners. Cancer rates at these levels have disturbing sociological effects on family stability, income, solvency. In the 12 years, my family and I have lived in our neighborhood, I can count the deaths (2), the survivors (4), the tragedies. Keep in mind, this is just the people I know of within some hundreds of feet from our home. Cancer is a vicious national tragedy. More frank discussion of its suspected causes and its tragic, expensive aftermaths should be encouraged.